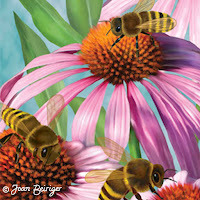 Flowers and geometric shapes are great motifs to embellish backgrounds and patterns in art collections. And it is easy and fast to create them in Photoshop by using the transform tool to do a continual repeat and rotate of a simple shape. The examples in this tutorial shows how to take a simple oval shape and create different looking flower motifs. By using this same technique, an endless number of geometrics motifs and looks can be easily created for art collections. Step 1: On a new layer create an oval by using the elliptical marquee too to start creating a flower. Step 2. Select a color in the foreground color swatch (at bottom of tool bar) and fill it by using the bucket tool. 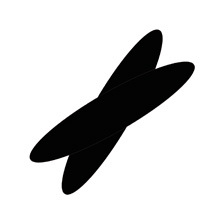 This example uses the color black. Step 3. Select the Free Transform command by pressing the Command key plus the T key on the keyboard. A bounding box appears that surrounds the oval (not shown in example). 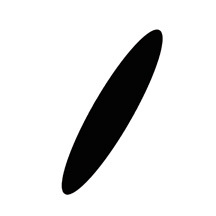 A center marker (circle with a dot in the center surrounded by four tick marks) is in the center of the oval. 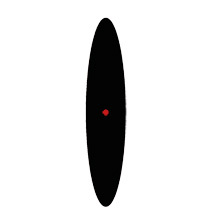 Note: The red dot on the oval in the example represents the center marker. The oval will be duplicated and rotated around the center marker. Step 4. Hold down the Shift key and drag outside the bounding box to rotate the oval. It will move/jump in 15 degree increments. Note: There are 360 degrees in a circle. Thus, 360 degrees / 15 degrees (1 jump) = 24 half ovals around the circle; 360 / 30 (2 jumps) = 12; 360 / 45 (3 jumps) = 8, etc. The example shows, the oval rotated to 30 degrees (two 15 degree jumps). Release the Shift key and press Enter. Note: Because the oval was rotated to 30 degree, the finished flower will have 12 petals after the petal is duplicated and rotated around the center marker six times. Step 5: Hold down the Command + Shift + Option keys and press the letter T to duplicate and rotate petal. Step 6: Continue holding down the Command + Shift + Option keys and pressing the letter T until the flower is complete ( four more times). Of course, you can place a different colored circle in the center to make it look more like a flower. Note: Doing this procedure generates six layers. You may want to select the layers and merge them into one (Command + E) to reduce the file size and make moving and duplicating the flower easier. Motif B: Now to have fun. The center marker can be moved to any position. And by moving it, the look of the same oval motif changes. 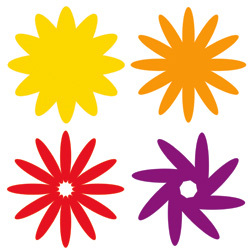 For instance, by moving the center marker to the tip of the oval (see red dot in the example) and doing steps 4 - 6 (previous example), the flower looks more like a daisy. Motif C: And by moving the center marker to below the tip of the oval (see red dot in the example), the daisy has longer and thinner petals with a hole in the center of the completed flower. Of course, a filled circle can be placed in the middle to cover the hole. 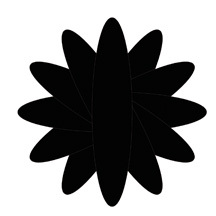 Motif D: Lastly, by moving the center marker to the side of the petal (see red dot in the example) and rotating the oval three 15 degree jumps the motif looks more like a clog wheel with eight spokes. Have fun by using this fast technique to create interesting motifs for your art collections. Experiment with all sorts of geometric / free form shapes, place the center marker in different positions, and rotate the initial shape in different 15 degree jumps. The type of motifs created is endless! Any comments that you would like to share about this article would be greatly appreciated. Click on the comment section below. Joan, you're the best! You always have such great Photoshop tips. Thanks for sharing your knowledge. Thank you Joan this fun technique can also use to make stripes. Joan you are the best. I notice all the time how crisp your art is...can you elaborate on your method? I've been working between Illus and PS, and the work isn't coming across too well. I also use a combination of PS and Illustrator (mostly for background swirls and icons) but the majority of my art is created in PS. How crisp an image looks is dependent on the brush that you use, the color contrast between the image and the background and most of all shading of the image. I use a variety of techniques for shading (not always all for the same painting) which includes "painting" the shading with brushes, using the dodge and burn tools, and using the drop shadow, inner shadow and inner glow method (found under layer / layer style) to make the central image(s) pop up from the background. It takes lots of experimenting to get the effect you want. Good luck! As always a great tip for art and Photoshop, what kind of computer are you on? I am looking to upgrade from my 6 year old IMac and I was curious what computer you were using. Thank you for all your tips, I love your blog. Thank you so much Joan! I am such a great fan of yours. Your blog is excellent.